UPDATED: December 2, 2016, at 1:45 p.m.
Four professors debated the First Amendment implications of the College’s plan to penalize members of single-gender social organizations on Tuesday, reframing a controversial campus issue in constitutional terms. 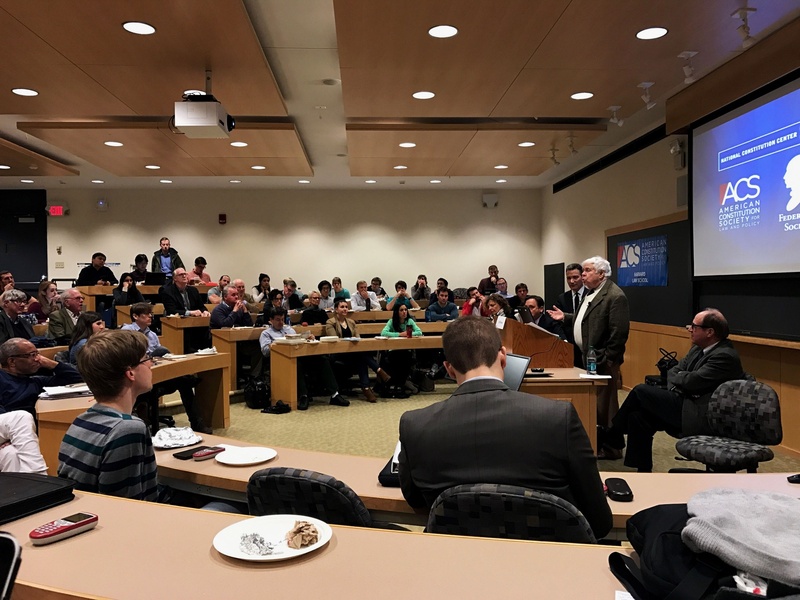 The debate, co-hosted by the Harvard Federalist Society and the American Constitution Society, drew notable professors like Randall L. Kennedy, graduate board members of all-male final clubs such as the Porcellian and Fly clubs, and scores of undergraduates and Law students. Sanford V. Levinson, a visiting law professor from the University of Texas Law School, talks about the constitutionality of the sanctions on single-gender organizations at an event organized by the Harvard Federalist Society and the Harvard American Constitution Society. The issue in question—a College policy first announced in May, which starting with the Class of 2021, would bar members of final clubs and Greek organizations from leadership positions in recognized student groups and College endorsement for prized fellowships—was cast in constitutional terms by moderator and President of the National Constitution Center Jeffrey M. Rosen ’86, who framed the debate “in terms of core First Amendment values instead of legal First Amendments rights” because private universities, unlike public universities, are not formally bound by the First Amendment. David L. Howell, a professor of Japanese history, and Diane L. Rosenfeld, a lecturer at the Law School and founding director of the Gender Violence Program, argued in favor of the constitutionality of the policy at the debate, while computer science professor and former Dean of the College Harry R. Lewis ’68 and visiting Harvard Law professor Sanford V. Levinson argued the sanctions violated First Amendment values. Dean of the College Rakesh Khurana, who led efforts to craft the policy, declined to participate due to scheduling conflicts, according to College spokesperson Rachael Dane. To determine the debate’s winner, Rosen anonymously polled the crowd both before and after the debate. At the outset, 69 percent of the audience voted that they thought the sanctions violated First Amendment values. After the debate that majority grew to 82 percent in favor of Lewis and Levinson’s argument. In his opener, Howell argued that because unrecognized single-gender social organizations are “for all practical purposes” College student organizations and incapable of existing apart from the College, “withholding certain privileges” from members does not violate core First Amendment values. He added that all applicants to the College apply with an understanding of the College's policies. “Choosing to attend Harvard therefore requires acquiescing to the core values that govern community life at the College,” he said. Levinson took issue with what he referred to as the “tremendously overbroad” breadth of the policy, arguing that including female clubs and sororities in the sanctions would not meaningfully decrease instances of “male violence against females” that the sanctions were meant to target. Rosenfeld agreed, calling the inclusion of women’s groups in the policy “problematic.” Nevertheless, she said the policy was both necessary and justified. “It might have found a finer brush with which to paint this picture, but if you’re trying to get at sexual assault at final clubs and get at the hostile environments that often are perpetuated within an exclusive all-male environment… I believe that [the sanctions] are a fair regulation,” she said. After the debate, Rosen said that though he has “no personal thoughts on the issue whatsoever,” he enjoyed hearing both sides of the topic. “We were looking for pressure points of free speech and debate on campuses across America and we saw the debate about the Harvard policy and thought that this would be a great place to launch the series,” Rosen said. Rosenfeld said she thought that issues brought up during the debate would help advance dialogue on campus. “I thought it was an interesting opportunity to talk about the issues,” Rosenfeld said. Since its announcement, the College’s policy has faced vocal opposition from national Greek organizations, national media organizations, and certain members of Harvard’s faculty, despite receiving support from coaches, administrators, and other Harvard affiliates. A recent Crimson survey of undergraduates found that 53 percent of surveyed undergraduates hold an unfavorable view of the policy. A similar poll in this year’s Undergraduate Council elections found 60 percent of students opposed the sanctions. —Staff writer Derek G. Xiao can be reached at derek.xiao@thecrimson.com. Follow him on Twitter @derekgxiao.